"Puttanesca is a hearty tomato sauce with a rich texture and a spicy kick. Pair it with hot pasta, and a fresh tasting, wholesome dinner will be on the table in no time." 2 (15 ounce) cans diced tomatoes, drained. Meanwhile, cook the pasta in the boiling water. Drain when still very firm to the bite, about 9 minutes. Reserve 1/2 cup pasta water. 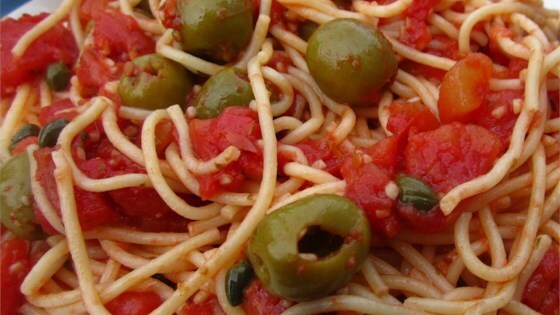 You can leave out the anchovies if you like, but for best flavor, leave them in! They melt right into the sauce and add authentic Italian flavor. Loved this recipe! I made it just as written, with whole grain linguini. My husband had seconds and ate the leftovers before I had a chance.